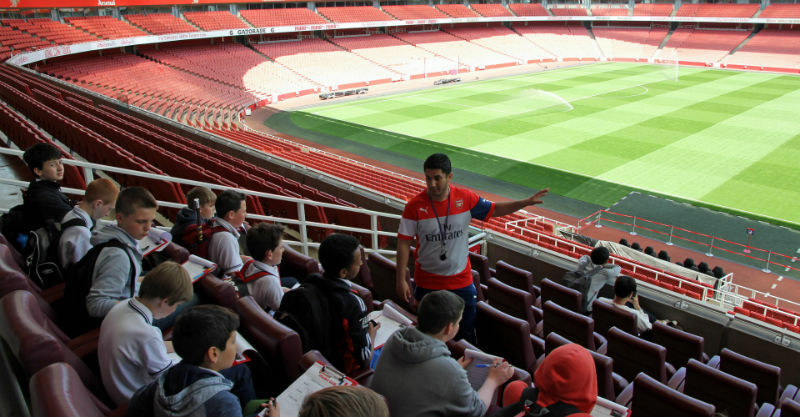 At the end of the programme, participating schools have the option to bring their students to Emirates Stadium, home of Arsenal Football Club, for a unique Language Day visit. The visit begins with a visit to the Arsenal Museum and is followed by a tour of Emirates Stadium with a multilingual member of the Arsenal in the Community staff. Here, pupils are encouraged to practice their language skills while they visit areas such as the Directors’ Box, media rooms and the Arsenal changing rooms, and to go pitchside to see the famous turf from the manager’s perspective. The tour will also provide insight into the language skills of Arsenal players, as well as the importance of languages off the pitch, both on matchdays and the day-to-day operations at Arsenal. Throughout the tour, pupils complete a quiz entirely in the target language to earn a prize at the end of the day. All attending pupils receive a certificate for their participation. A Language Day visit lasts approximately 2 hours and schools are able to choose between a morning or afternoon visit. Visits can take place Monday to Friday during term-time only, excluding home matchdays. Only pupils who have completed the programme are able to attend the Language Day visit.